Canadian Anti Spam Legislation (CASL) in effect since July 1st 2014 will permit lawsuits by individuals, effective July 1st 2017. 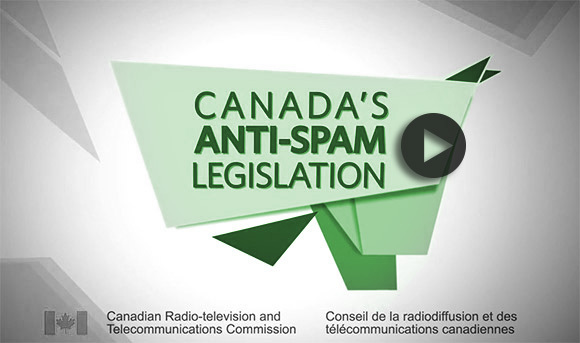 What is new: Until July 1st 2017 only the CRTC could bring an action. After this date, any individual may bring a case forward for prosecution. Fines are HUGE! $1million for individuals, and $10 million for businesses, per instance! After July 1st 2014, such a request could be considered a CEM. Determine if your electronic messages are commercial in nature. The law applies to commercial electronic messages (CEMs) only. A CEM is defined as encouraging participation in a business transaction or activity, regardless of whether there is an expectation of profit. Get the consent of your recipients, and keep records. The legislation requires obtaining "express" or "implied" consent. Express consent means that a person has clearly agreed to receive a CEM before it is sent - you cannot request consent in a CEM. Consent may also be implied in certain situations, for instance if there is an existing business or non-business relationship. In all cases, ensure you understand the consent you have received from your recipients, and keep detailed records in case you are ever asked to prove that consent has been received. Identify yourself and anyone you represent in the message. Provide contact information including your business name, postal address and either a telephone number or e-mail address. This information must be accurate and valid for a minimum of 60 days after the message has been sent. Include a working mechanism that allows the recipient to unsubscribe from receiving additional messages. This must be at no cost to the recipient. Ensure that no part of the CEM is false or misleading, including the sender’s identity, subject line, any Web links, or any other material part of the message’s text or data. Sending a CEM without the recipient’s express or implied consent. This includes messages to e-mail addresses, and text messages to a cell phone. Sending a CEM without fully identifying the sender. Making false or misleading electronic representations in the promotion of products, services or business interests. Sending a CEM without a clear way and means for the recipient to unsubscribe. The installation of computer programs on another person’s computer system without the express consent of the owner of the computer system or their agent, such as an authorized employee. The collection of personal information by accessing a computer system in violation of the Criminal Code of Canada. Collection of electronic addresses by the use of computer programs, or the use of such addresses without permission, a practice known as "address harvesting". You must retain records of opt in, and assume all the management of your unsubscribe details. You must follow the legislation requirements as described by the Government website referenced above. At minimum, 1) maintain written consent to receive your emails 2) provide your full business name address and contact information on each email and 3) process any unsubscribe requests within 10 days. Via this blog and prominent reference to this, MyArtClub.Com is warning artists and art groups to diligently follow all legally required practices per the CASL as required since 2014. MyArtClub.com changed its Terms and Conditions back in 2014 for artists and art groups and since then has and will continue to require and record acknowledgement of the new terms with each emailing. MyArtClub.com includes an unsubscribe function and in addition provides postal address on record, and email address. MyArtClub terms and conditions require: Any artist or art group assumes full responsibility for meeting the new CASL government requirements including their mailing list being up to date, and that express or implied consent has been obtained for all the email addresses being emailed. Essentially the sender confirms they are aware and understand the new CASL legislation referenced above, and that if necessary they have consulted professional legal advice. MyArtClub terms and conditions have always included a limitation on our liability to only one year membership fee; that artists or art groups indemnify MyArtClub.Com from any and all legal liability (as permitted by law) including reasonable fees for legal counsel MyArtClub.Com may incur, should the case be ruled in our favour.